The widely use of the three oil refining processes today - hydrogenation, interesterification and fractionation - extended the range of applications of the edible oils. These processes principally serve the purpose of modifying the melting properties of oils and fats of the edible oil which pressed by the oil pressing machines in order to improve their certain properties in edible uses. 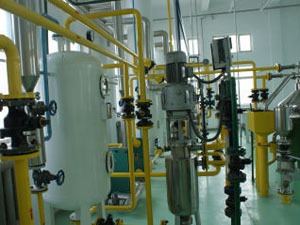 In edible oil plant, fractionation processes consist of a controlled cooling of the oil, so that make it crystallizated. The remaining olein is then pressed out from the solid stearin by the way of centrifugation. Different oils and fats have different characteristics due to the fact that they consist of a great number of different triglycerides. These contain fatty acids with carbon chins of different lengths and with different degrees of unsaturation. This technique is called fractional crystallization and used to obtain oils or fats more suitable for example, as edible oils. Solvent Fractionation: through continuous crystallization of the oil in a solvent followed by separation of the liquid and solid fractions through a continuous drum filter. Solvent fractionation, involves the use of hexane or acetone to let the high-melting components crystallize in a very low-viscous organic solvent. This can be helpful with respect to the selectivity of the reaction, but mainly offers advantages in the field of phase separation: much purer solid fractions can be obtained, even with a vacuum filtration. Being a more expensive process, it is less common than dry fractionation and only comes into the picture when a very high added value of (at least one of) the resulting fractions makes up for the high cost.